Alexander Morozevich has somewhat dropped off the chess radar recently, but at his peak he was not only one of the most exciting and imaginative players in the world but reached no. 2 on the official FIDE rating list and no. 1 on the live list. 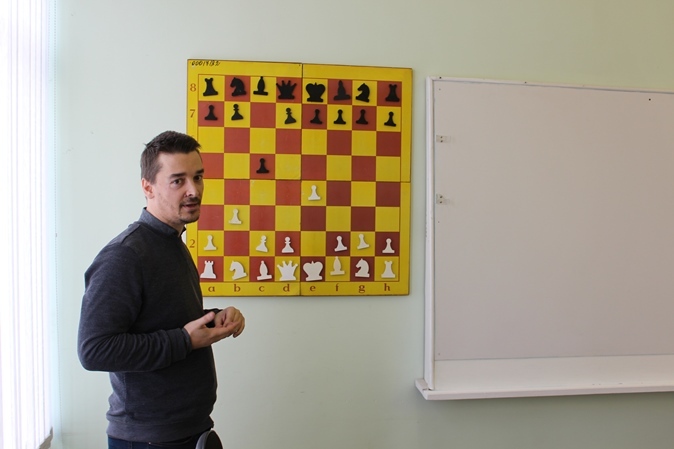 He recently gave a lecture at his old university in Moscow, and also gave an interview where he talked about what makes Carlsen no. 1, gender differences in chess and how chess has changed for young players compared to when he was starting out. When I was in the elite I needed to follow and get to grips with such information. Now I’m playing for pleasure, doing more coaching and writing methodological material and I’ve got absolutely no interest in getting into the minor intrigues of FIDE. Carlsen, in my view, has a better feel than anyone else for changes on the board. I don’t have the impression that he’s the most talented, if I have the right to judge chess talent. I’ve played a lot of games against all the elite players, and that’s my “experienced” opinion. Carlsen is very balanced. He has outstanding drive, he’s exceptionally strong-willed and ambitious. That’s visible in all games, even when in training sessions we played basketball on one hoop. For us that was a way of switching off and relaxing, but for Magnus it was another arena for victory. Of course the majority of elite players have that “killer instinct”, as otherwise it would be tough to achieve similar heights. During games against him I got the feeling that I was playing with an intelligent opponent. In tricky situations he makes not the best, but intelligent moves – it’s hard to explain. That’s the reason he so invariably plays rapid and blitz well. No other sportsman has such stability. In my opinion there are players more talented than Carlsen: such as Ivanchuk or Nepomniachtchi. But they always lack that desire, that drive. Therefore Carlsen is for now the number one. Undoubtedly during the match Sergey had excellent chances. He put up a wonderful fight and was leading by a point at the very end, but, unfortunately, it came down to tiebreaks, where Carlsen was noticeably stronger. Overall, there were chances, but in the end the match was lost, and singing his praises, as many are now doing, seems strange. Chess is a sport, not discussion about what might have been – the score is on the scoreboard and the World Champion is as before. I think it was a tough match for him and it was clear that Carlsen wasn’t playing at his best. In hindsight he looked to have been struggling in the match. On the other hand, knowing him, you can say for sure that Magnus will draw the correct conclusions and come back even more dangerous than before. Between a man and a woman there are differences, and significant ones, but we’re all, first and foremost, people. Can I, simply looking at the notation of a game, say that it was played by a woman? I tried it a couple of times and I didn’t manage – there are no clear differences. In the results, meanwhile, there are differences, and only a few women have so far been capable of playing on the level of the men’s Top 100, and I don’t fully understand why that’s the case. In other intellectual games the proportions are more or less the same, with the very top occupied by men. It would be interesting to do research on that topic. Women in chess have one undoubted advantage: they can play in men’s tournaments, while we can’t play in women’s. I once asked a FIDE official: “Why is there such an injustice?” His answer surpassed all my expectations: “You understand, there’s a World Championship for women and a World Championship for people”. When talented people leave a country it’s undoubtedly a loss. People look for stability and, perhaps, they find it. I didn’t have that need. At 17 years old, when I won a rapid tournament in New York, certain people actively worked on me: “Look at the events taking place in Russia – stay here, and with us you’ll be a millionaire, we’ll organise everything for you”. I said that I want to become a chess player and not a cash cow, and therefore being in Russia was optimal for me. I had a period when I worked for half a year as a coach in Qatar. It was a good experience, in order to grasp how things are “over there”, but no more. I consider Russia a good place for a chess player. Times have changed and now that’s not an achievement. Chess isn’t such a complicated game - if a person is more or less predisposed to it, has desire and persistence, then five to six years of study is perfectly sufficient. Nowadays it’s no surprise if a kid becomes a grandmaster at 12-13 years old. Partly that’s because of the devaluation of the title itself – there are too many of us. Plus, access to information has become open. In those years when I was growing up there was nothing apart from Soviet books. Notebooks were kept, and then in secret passed from coach to coach, and a lot of that didn’t withstand the test of time. Finding opponents to play against was also tough. I remember in ‘95 there was a tournament in Yalta. We played the first round, then suddenly the organiser gathered the participants and said: “That’s all, guys! Sorry, but there’s no money”. At a meeting of the participants it was decided to continue the tournament in a rapid format, with expensive souvenirs as the prizes. I managed to catch hold of Vassily Ivanchuk and used every means I could to lure him into playing blitz. Naturally he looked at me without enthusiasm: he was third in the world, while back then I’d only made it to the bottom of the Top 100. For third place in the rapid tournament they awarded me a case of wine. In order to get Vassily’s attention I generously put my whole case up for grabs. Back then such a chance to play was unique. Now you have the internet at your disposal and you can find the most varied players, even the elite, and play games against them. A huge stream of information is available: databases, books, annotated games, magazines, articles. From the point of view of knowledge chess has become more accessible, and thanks to that, young players should develop faster. As I said at the lecture: whatever success you achieve, whatever Champion you become, above all remember that you’re a person. And you’re lucky to have been born at all. If playing makes you better, if it develops you, if you feel that you’re happy, then go ahead and don’t listen to anyone. If you’re stressed, if you want to prove something to someone, then think about it. Perhaps this activity won’t make you happy and will create problems for you in the future. Get a sense of the degree to which the choice fits your nature. Then studying at the Russian State University of Physical Education, Sport, Youth and Tourism can help you and give you an essential grounding. The ability to exchange experience with other sports is extremely precious.